I love finding and sharing some eBay style steals everytime a new season rolls around. I’ve had a hunt around the website, this time for some cosy goodness for Autumn. Jumpers are an obvious choice for A/W. I’ve been stocking up on SO many this year that I basically have enough for every day of the week and then some. The patchwork high neck jumper is an all-around basic jumper with the perfect colour scheme for autumn. At only £7 it’s a must-have! The tassel detail pink jumper is something a bit different for me, a bit feminine but with super cute detailing. It’s £10 and if the pinks a bit too girly for you, it also comes in grey and white. 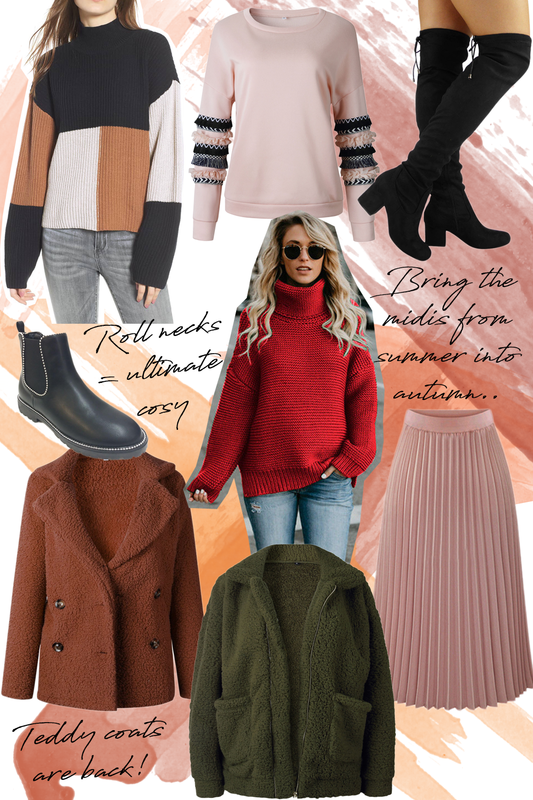 The super chunky jumper is my ultimate fave in winter and I am all for this red turtleneck number. It’s £15 and also comes in a bunch of colours like green, pink, blue and yellow. Autumn is time to sling away the sandals and trade in the boots. I love some sassy Over the knee boots for the colder months. They’re the perfect way to dress up feeling a little bit *extra*. These eBay ones are only £17, come in a bunch of colours and are almost identical to those on the high street. Next, every girl needs a pair of chelsea boots in their collection. These studded chelsea boots have that extra little detail and will only set you back £17 too. I have loved the midi skirt style this Summer/Autumn, and I totally want to ride it right through Winter into Spring. This pink pleated midi skirt is adorable. It would look SO cute with a little white jumper and some heeled boots. Super cheap too at only £8!! Finally, my all-time favourite piece of clothing for A/W… the coats. Anyone else have an unhealthy obsession with coats? I’m SO glad the teddy bear style is still in this year, so obviously that’s what I picked. I liked the style of the brown teddy bear coat, it’s one I haven’t seen on the high street yet and this colour is perfect for Autumn. And it’s only £13…. how?!?! Next is the khaki teddy bear coat. I actually got the camel colour of this coat last year, see me wearing it in this post, and it’s honestly one of my favourite things. SO cosy, SO easy to wear and SO cheap. Khaki would be my next pick of colour and this costs £14.. baaaargain! Have you got your eye on any eBay bargains right now? Let me know! "Why I didn’t read your blog"